Well it is time for a new challenge over at Hobbyworld. This time the theme is sweet and loving, you need to go to the Hobbyworld blog for all the details. I wanted to try out the chalkboard techique. I loove the look and since I got a stamping Gear from Inkadinkado in my DT-kit for this month I was happy to see that the stamps that came with it was perfect for this style. I added a stamp from Simon Says Stamp and some of the new really cool Spellbinders, Prima Flowers and amazing papers from Basic Grey and the card turned out lovely! I know it doesn’ look at all like my style but I love it! 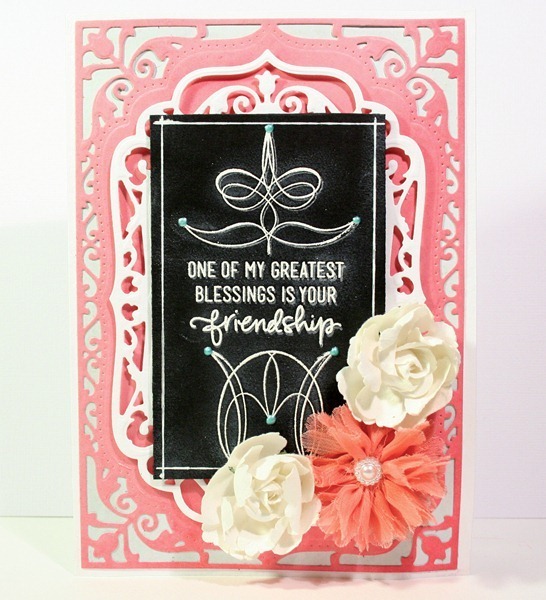 The Spellbinders do all the work and the contrast with the blackboard-style stamping looks so great. I just love it! Thanks for stopping by and make sure to take part in the challange, there are a lot of amazingly cute romantic papers out now. Make a valentines card for someone you love or for a great friend. I’m all for showing some love to the people around me right now. You never know for how long you will have them in your life. Take care now!